When I first heard that the Hard Rock Hotel & Casino Las Vegas was going to take over The Sloppy Tuna for a night of partying “Las Vegas style”, I didn’t know what to expect. Already explaining on the website that there would be incredible raffle prizes such as a guitar signed by Judas Priest and free hotel suites given away every hour, I knew this party was not to be taken lightly. Famous for its Tuesday Ladies’ Night and Wednesday’s “Sloppy Derby” (Goldfish races where winner takes all), The Sloppy Tuna adds a fresh perspective to Montauk. Its atmosphere is about having a good time and enjoying yourself. 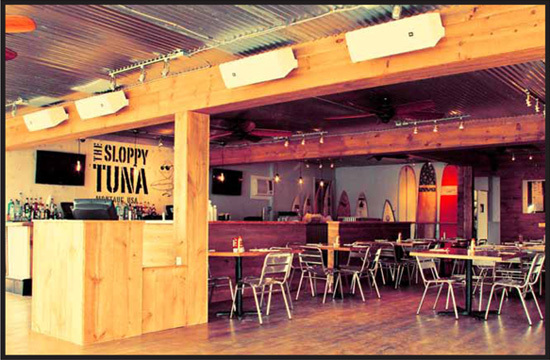 Whether it’s mingling on Rocky’s Roof Deck or dancing to the Reggae Concert Series’ Live Music on Saturday afternoons, The Sloppy Tuna guarantees a good time. On Saturday, we got there in the late afternoon to check out the crowd and the “relaxed beach vibe” that The Sloppy Tuna is known for. The crowd was a mix of surfers/beach goers enjoying a drink after a day of sunbathing and ocean sports, and tourists enjoying some late lunch. The staff were helpful and knowledgeable of the drinks. We sipped on Bloody Marys, chatted on Rocky’s Roof Deck, and absorbed the sun and smell of the ocean breeze. As the sun set, the party got into full swing. The relaxed beach atmosphere became infused with the energetic nightlife as soon as the music switched to the DJ. 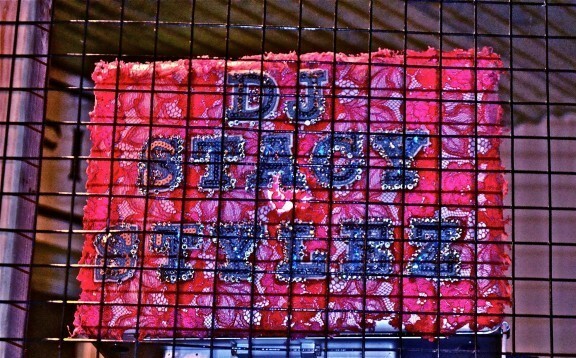 One of New York City’s hottest DJs, Stacy Stylez, spun in the DJ cage, keeping the beats fast and the crowd moving. And let me just tell you, everyone was moving. Dancing happened, drinks were flowing, and prizes were given away. Photo Booth pictures were taken, numbers were exchanged, and everyone that left had a smile on their face. Las Vegas may know how to throw a party, but The Sloppy Tuna held their own. With famous celebrities checking out the place such as Charlie Sheen, Bethenny Frankel, people are starting to take note. Which they should, because The Sloppy Tuna is here to stay.